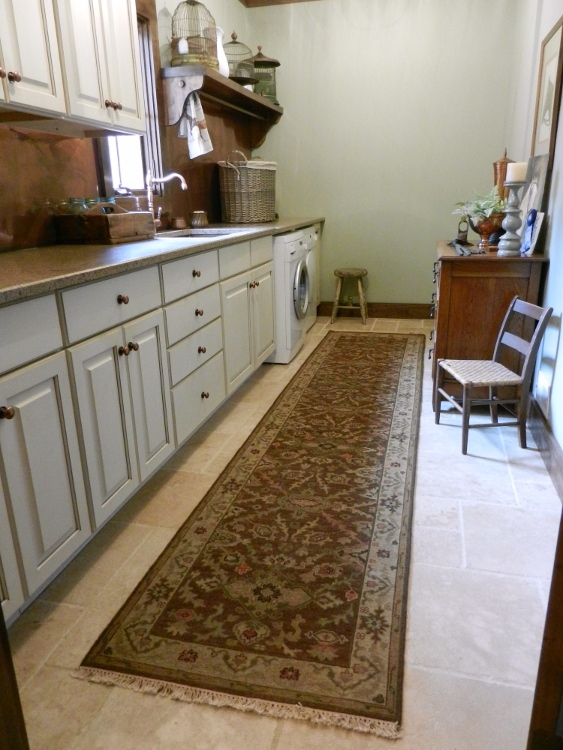 Minor changes make major visual improvements in a laundry room face lift. 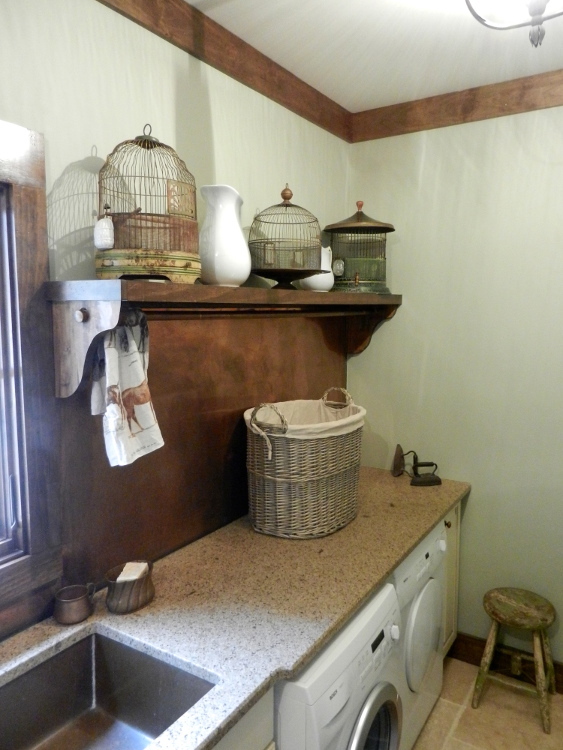 A few things have changed in our main level laundry room since moving into our Alabama Stone Cottage. 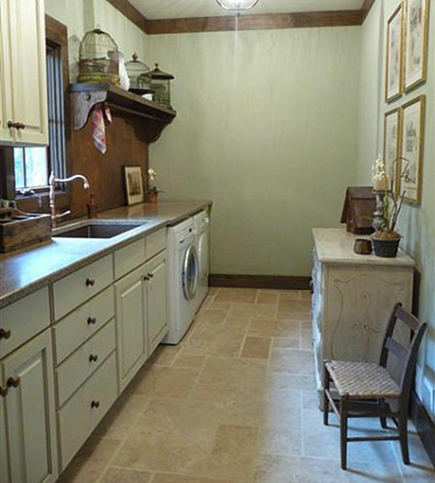 It’s my “pretty” (and functional) recently redone laundry room, a well-deserved space after making do with a corner of the unfinished basement in our last house for 20+ years. 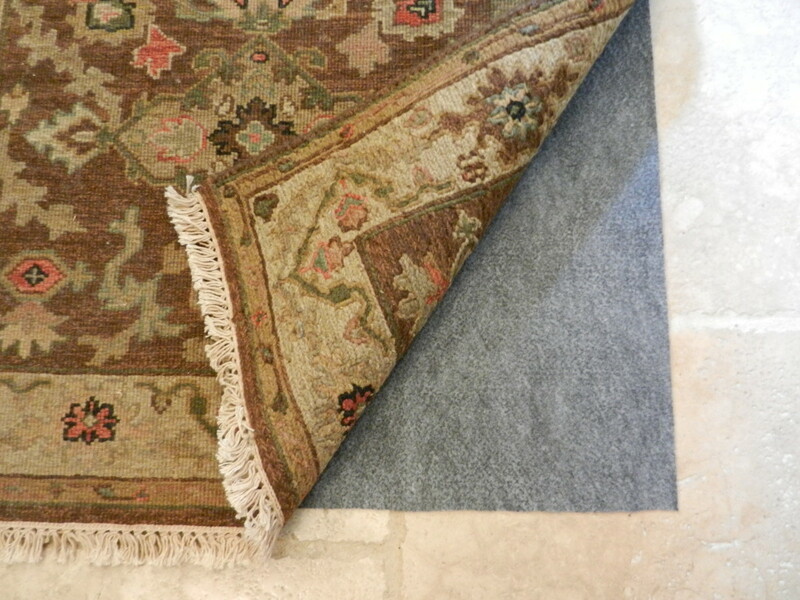 I started looking for the perfect Soumak runner for the long, narrow room a bit too late. When I finally found Mr. Perfect Rug it had been discontinued and the twelve-foot-long runners were sold out. After a few months of sulking, I started searching again and decided on this brown and ivory hand knotted flatweave by Kalaty (Su-148 from Payless Rugs). I knew I would be pleased with the quality and construction of the rug since I already owned two of their Soumaks when are virtually indestructible. Spilled liquids bead up on top for an easy cleaning These rugs are much softer than sisal, which is often a concern, but I was a convert after my first purchase. When we added more bookcases to our lower level L-shaped hallway, and my younger daughter needed her painted dresser at her own house, the redo ball started rolling. I always try to invest in pieces that can be moved around the house. 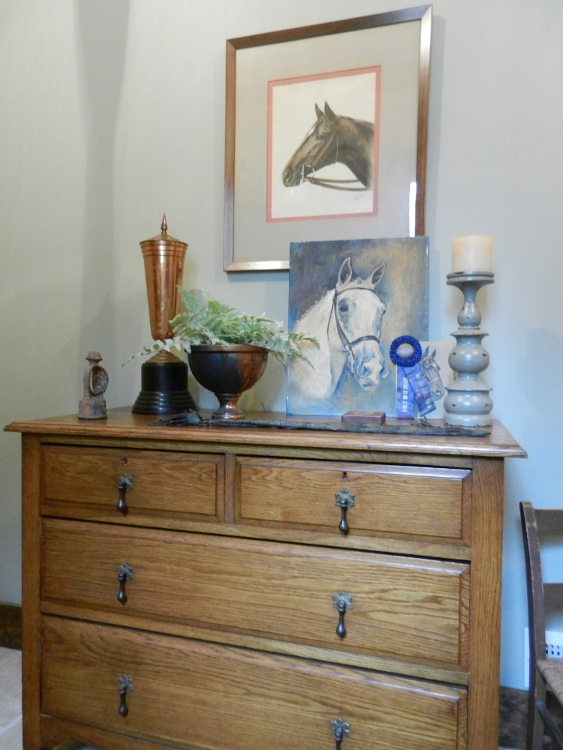 This vintage oak dresser started out as a gift wrapping station in the breakfast room of our last home, then moved to the stair landing. I had horses growing up and we currently live in a horse community, so the collection of equestrian portraits, trophies and other related items are near and dear to my heart. The lined wicker basket was purchased so kitchen linens in need of washing could be tossed in. 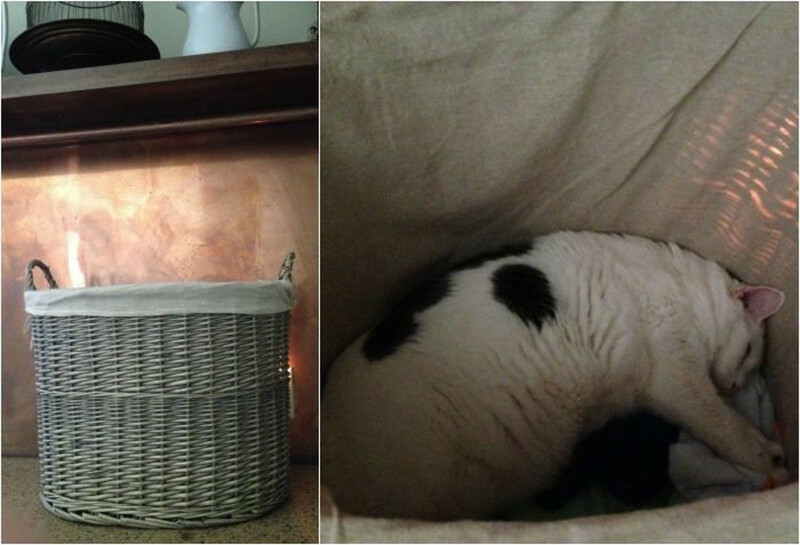 I often hear rattled breathing, deep snores and Darth Vader-esque noises coming from that same laundry basket since kitty has claimed it as his favorite napping spot. I like the warmth and texture this, and other added items, brings to the room. 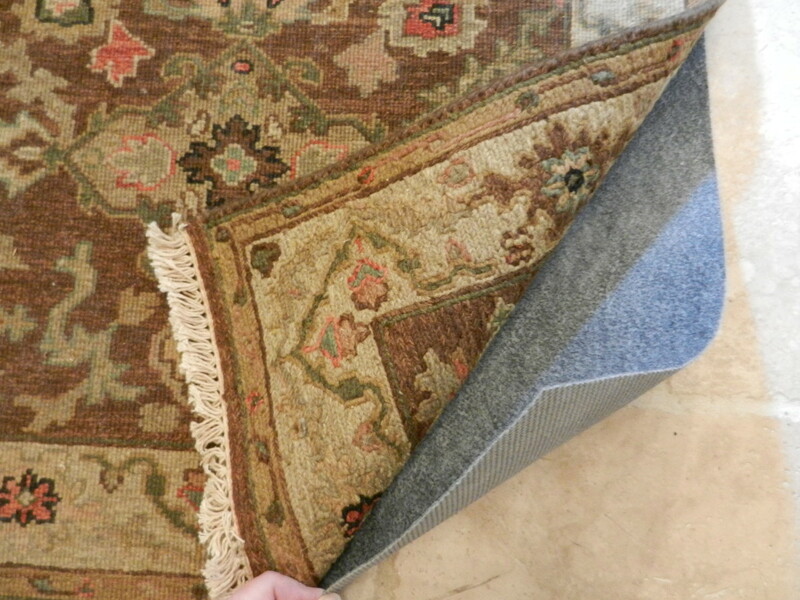 Every rug needs a good rug pad, and Rug Pad USA has the best prices I’ve seen anywhere. The website is easy to use with Shop By Floor Type or the Rug Pad Finder. There are more ways to shop at the bottom of the home page; by material, floor type or popular sizes. The page also features photographs of the various rug pads available with easy to read descriptions. I immediately found the Superior-Lock 1/8″ felt and rubber pad that is best for the flatweave and travertine floor combo. It is extremely thin, and of excellent quality, therefore not noticeable when you walk on the rug. Mr. Shops likes this since he wasn’t required to alter the laundry room door so that it would swing over the rug and pad. I like that the pads are made in the USA from 100% recycled felt and cut fresh when orders are place, not to mention the fantastic warranty. I will definitely be ordering the proper pads for several more rugs around the house.